The transit system is in crisis mode: delays on the subway have tripled over the last five years, subway stations are crumbling, and aging signal systems can’t keep up with growing ridership. Meanwhile, our streets are increasingly clogged with traffic, which results in buses that travel at walking speeds, and impatient drivers who endanger people walking and biking and abuse every inch of space. This is unacceptable. There is a group of lawmakers who don’t want this nightmare to end — and they are trying to squash the best idea out there for fixing our transit system: congestion pricing. It could fix the subways. It could make our streets safer. It could end gridlock as we know it. When congestion pricing was enacted in London, total traffic crashes fell 40% and the bicycle crash rate fell 80%. Only 4% of outer borough commuters drive to Manhattan for work, and on average, New York City car-owners earn twice as much as New Yorkers who don’t drive. 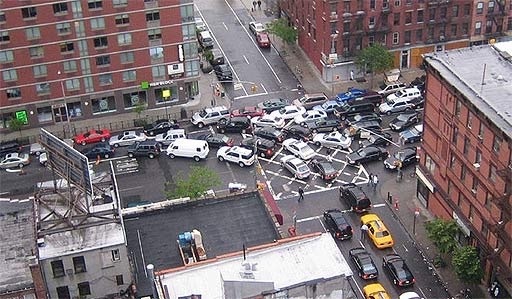 Congestion pricing just makes sense. This entry was posted in CHEKPEDS, Congestion and tagged health, policy, traffic. Bookmark the permalink.